Best Aussiedoodle Breeders, specializing in tricolor Aussiedoodles and beautiful merle Aussiedoodles. Located in Greenville, SC, Best Aussiedoodles serves families from Charleston, Columbia, Atlanta, Charlotte, Raleigh-Durham, Jacksonville, Knoxville, Richmond, Baltimore, Chicago, Phoenix, Hilton Head and other cities. Aussiedoodles are incredibly smart, loyal and very loving. They are sometimes called Einstein dogs for their smarts and velcro dogs for their loyalty. Aussiedoodles have thick beautiful coats that typically do not shed and are hypoallergenic. Perhaps an Aussiedoodle from Best Aussiedoodles would be a good fit for your family. BestAussiedoodles.com provides quality Aussiedoodle puppies in the Southeast. Best Aussiedoodle Breeders focuses on family raised, home raised puppies that are well-socialized. An Aussiedoodle is a designer dog. Aussiedoodles are a cross between the incredibly intelligent Australian Shepherd (Aussies) and the equally intelligent and non-shedding Poodle. An ideal Aussiedoodle is incredibly intelligent, fiercely loyal, highly trainable, great with kids, and low-to-non shedding. Many people wonder how Aussiedoodles differ from Labradoodles and Goldendoodles. Aussiedoodles (called Aussie-poos by some) share the friendliness, health (due to hybrid vigor) and low-to-non-shedding coat of their cousins the Goldendoodle and Labradoodle. The primary difference with an Aussiedoodle is that Aussiedoodles tend to exhibit a greater loyalty to their owners. Goldendoodles and Labradoodles tend to never meet a stranger. Aussiedoodles are friendly enough, but they like to stick close to their owners. You could walk through a crowd with an Aussiedoodle following you the whole way. Your Goldendoodle or Labradoodle would get lost licking other strangers. We've tried several top quality foods and have landed on TLC puppy and dog food. TLC is a fabulous choice for quality, value, and service (they ship fresh food for free to your door). Click the logo to the left to get a $5 off coupon, or if you go to the site directly, enter coupon code 68765-1025. Like the other doodle dogs, Aussiedoodles are usually excellent with children, though sometimes their herding tendencies may get annoying to children who don’t like to have a dog right next to them all the time. Many Aussidoodles, like Australian Shepherds live up to the nickname “velcro dogs” because Aussiedoodles always seem to be attached to their owners. Another difference is that Aussiedoodles usually have a much greater variety of coat coloration (compared to Labradoodles and Goldendoodles) and sometimes have blue eyes. Besides having a more loyal personality and different coloration in coat color, a third difference is that Aussiedoodles tend to be less expensive than a comparable Goldendoodle or Labradoodle. This is probably due to the fact that Aussiedoodles are not yet as popular as Goldendoodles and Labradoodles, and the reality that Aussies tend to be working dogs which are relatively inexpensive compared to some show breeds. We do not breed dogs for our livelihood. I am a customer carpenter and my wife is a stay-at-home mom with our kids. We enjoy our female Australian Shepherd, River, our Aussiedoodle girl, Blade and our male Standard Poodle. The three of them are great dogs with excellent temperaments. Our family-raised Aussiedoodles can make excellent pets for someone looking for an energetic dog that often will not shed (or shed very little). An Aussiedoodle will need plenty of exercise or its natural energy and high intelligence can create problems for a family. At BestAussiedoodles.com we are proud to have partnered with Crockett Doodles. Crockett Doodles has specialized in Goldendoodles (http://bestGoldendoodles.com) and Labradoodles (http://ChocolateLabradoodlePuppies.com). Over the past many years, they have developed an outstanding reputation as premier Goldendoodle and Labradoodle breeders in the Southeast. They have a strict application process with far more demand than supply. 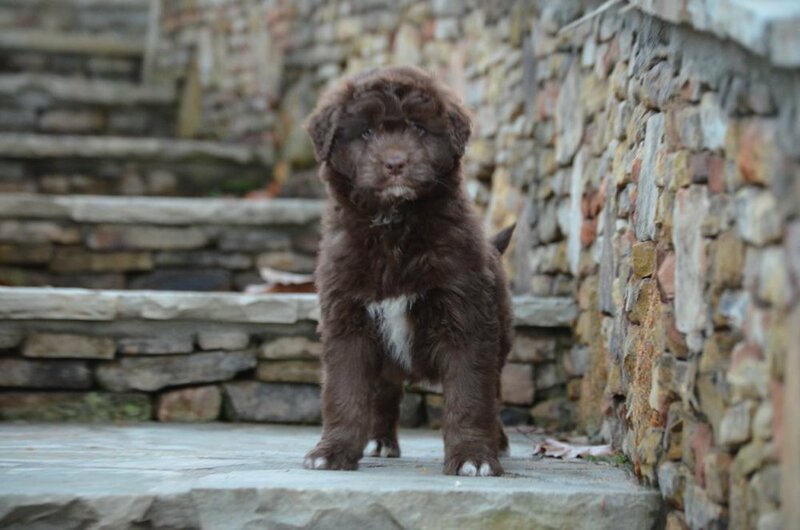 Crockett Doodles is one of the only doodle breeders who has to weed out many potential families through their application process because their Goldendoodle and Labradoodle pups are in such high demand. BestGoldendoodles and ChocolateLabradoodlePuppies have two of the most popular doodle webpages and Facebook pages of any doodle breeders in the world with thousands of new “likes” every month. We went to BJU where Dr. Crockett taught, and are actively involved at Mount Calvary Baptist Church where Abigail (Minnick) Crockett’s dad is the pastor. We count the Crocketts as close friends. Crockett Doodles has stayed committed in philosophy to home-raised pups, and they have helped us from beginning to end with the process of finding a quality Aussie, creating a website, providing ideal care for the pups, and guiding us through the development of a reasonable and fair application process. We have been amazed at how many people want an Aussiedoodle from a breeder who cares for the parents and the Aussiedoodle puppies and tries to do things the right way. 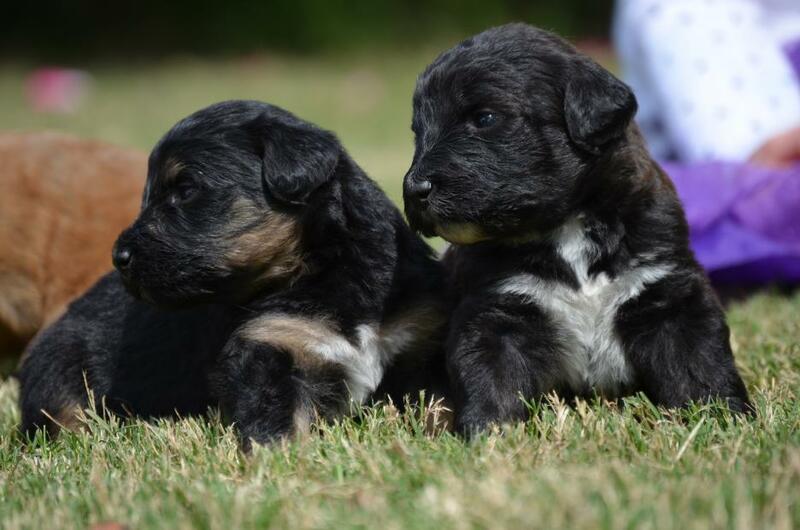 It’s a great joy that we are able to very selective in choosing the best homes for our Aussiedoodle puppies through an application and selection process that we try to make thorough, thoughtful, and fair. Although River has just one litter a year of F1 Aussiedoodles, and Blade has a yearly litter of F1b Aussiedoodles, Crockett Doodles has partnered with a couple other family friends to each do a home raised litter a year, so that we can offer a few litters a year of mini Aussiedoodles, F1 Aussiedoodles and F1b Aussiedoodles here at BestAussiedoodles.com. Each pup will have the same full health warranty that goes home from Crockett Doodles. We always tell Aussiedoodle applicant families in advance not to take it personally if they are not chosen for an upcoming Aussiedoodle litter. We always have way more demand for Aussiedoodle pups than supply (from River and Blade’s yearly litter), we’re typically not choosing between good and bad families, we’re choosing between good and the best. We feel privileged to be in that position for our Aussiedoodle pups, but we feel terrible for the potential Aussiedoodle families who are not able to get a pup from us, or have to wait 3-4 months. An Aussiedoodle is a designer dog mix that is part Poodle and part Australian Shepherd (Aussie). Although Aussiedoodles are not currently as popular as Goldendoodles or Labradoodles, they are quickly grown in popularity. Aussiedoodles tend to have a beautiful color variety not available in Goldendoodles or Labradoodles. Like Goldendoodles, Aussiedoodles have absolutely beautiful coats (unlike Labradoodles). Aussies and Poodles have some of the most desirable coats in the dog world, so the mixture often results in an incredibly soft Aussiedoodle coat with outstanding texture, curl, and thickness. Aussies have outstanding personalities and an incredible urge to please. One well-regarded breeder of Aussiedoodles, Goldendoodles, and Labradoodles said that her Aussiedoodles actually make better guide dogs and therapy dogs than even the Goldendoodles and Labradoodles. Both Australian Shepherds and Poodles are legendary for their brains and desire to please. Mixing the two together results in a highly trainable dog. Aussiedoodles have been called “the Einstein dog.” They also are great at walking off leash. If you were walking with a pet doodle in crowd, a Labradoodle would likely follow you from a little distance. A Goldendoodle might get lost in the crowd licking every stranger and wagging his tail ferociously. An Aussiedoodle would likely stay right with you (there’s a good reason Aussies are known as “velcro dogs”), in less he saw some cats or small animals to herd. Aussiedoodles are probably the most loyal of all the Doodle varieties. Your pet Aussiedoodle would follow you to the ends of the earth. Find out about our organization, mission, process, and more! Ready to take the next step? We're now accepting applications at our sister site. Apply today to see if your family would be a good fit for one of our quality home-raised puppies!